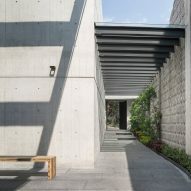 Californian studio Belzberg Architects has built a concrete culinary school in Mexico City, offering a range of facilities to the local Jewish community, including rooftop yoga and art galleries. The 650-square-metre Taller Estrella Jafif is located in Bosques de las Lomas neighbourhood, where a large majority of the city's Jewish community moved to between the 1950s and 80s. 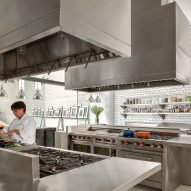 The brief given to Santa Monica-based Belzberg Architects was to provide local residents with a cookery school that conforms to Jewish religious dietary laws, known as kosher. As the project developed, the firm decided that the building should also become a hub of cultural and sports activity for its users. "The building's programme expanded to provide the surrounding community with a venue for small events and gatherings," said Belzberg Architects. "In addition to offering kosher cooking classes, the space hosts art exhibitions, yoga classes, large catered celebrations and a variety of other activities, allowing the neighbours to stay local rather than travel miles through Mexico City's protracted traffic." The cookery school occupies the ground floor of the building, wrapping around a central courtyard. 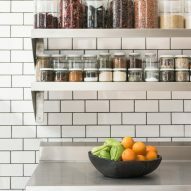 The kitchen is placed towards the front of the building, with glass doors offering views to and from the adjoining dining room. 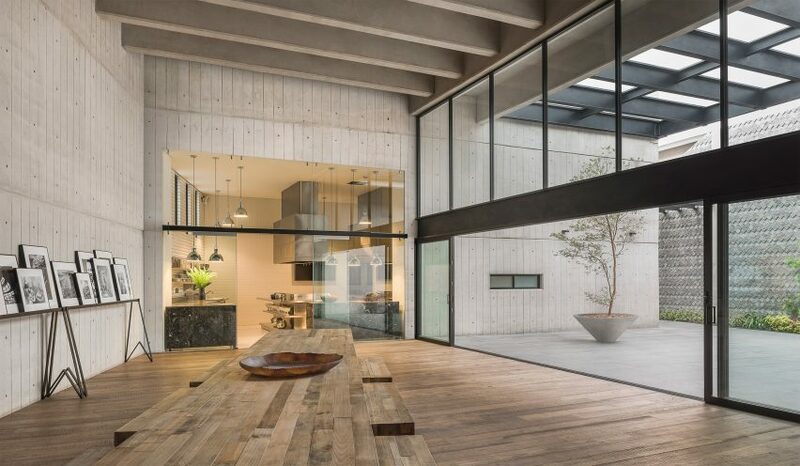 Concrete walls are imprinted by vertical wooden planks, and are complemented by exposed concrete beams and rough wooden flooring. These stripped-back finishes were chosen so the room could be adapted for different uses. For example, the long wooden table in the centre can be moved to create an open gallery, with the bare walls providing a backdrop for displaying artwork. "The material palette of the project strikes a balance between achieving an expressive, modern design and a simple backdrop appropriate for any use," Belzberg Architects said. 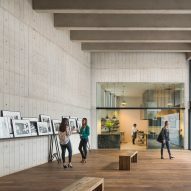 "Board-formed concrete, exposed beams, and weathered wood floors express the construction technique, while emphasising the double-height scale of the main space." A large glazed wall is fitted with sliding doors that open from the dining room to the yard. The patio is topped with a glass roof, while printed concrete walls match those inside. The outdoor space is sparsely populated, apart from a tree that grows from a large planter, but dining benches can be moved from inside to provide seating for reading. Decorative details are added by tiles that pattern the wall running along the edge of the plot. This wall extends from the yard, beside a ramped and stepped walkway – also covered by a glazed roof – and ending at the entrance. 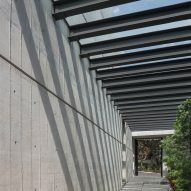 It forms one of the building's many access points, intended to keep separation between different events and activities. Two doors from the driveway provide access to the kitchen, while a landscaped outdoor staircase on the other side of the building leads up to events on the roof terrace. Visitors can access the interior through glass doors into a homely styled through-space. 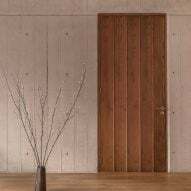 A wooden door detailed to match the markings of the concrete walls opens to an office and a reception room on the other side, and a wooden staircase with a glass balustrade that leads to toilets on a mezzanine level. There is also a mezzanine on the opposite side of the building, above the kitchen floor, where staff rooms are placed. Taller Estrella Jafif is among a number of cookery schools of architectural merit. Other examples include a cookery centre in Seoul based on European factory interiors and one in an contemporary shed.